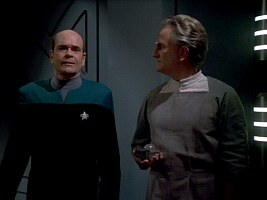 It was a wise decision to introduce the fictional unit "quad" to measure the amount of computer data in TNG. Real-world hard disk volumes have increased ten thousand times since, and TNG computer data of a few megabytes (which was still a lot in 1987) would have become ridiculous by the early 21st century. Considering that mentioned volumes were usually in the range of kiloquads to megaquads in TNG, it is obvious that one quad has to be several orders of magnitude more than one bit or one byte. 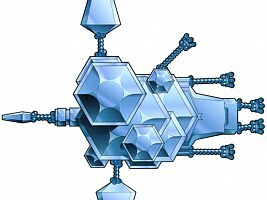 According to the TNG Technical Manual the Enterprise-D has three main computer cores, two in the saucer and one in the stardrive section. Each core has "2,048 dedicated modules of 144 isolinear optical storage chips". At a capacity of 2.15 kiloquads per chip, this amounts to only 630,000 kiloquads per computer core. The STTNG Technical Manual, however, continues that "total storage capacity of each *module* is about 630,000 kiloquads". Shouldn't this read "of each core" if the other figures are correct? Since the calculated and the given value are the same, it is almost safe to say that the intention was 630,000 kiloquads per core and not the figure but the word "module" is wrong. Two of the computer cores working as backup systems, there would be no more than the above 630,000 kiloquads on the whole ship. There is possibly some more memory capacity in separate isolinear chips (2.15 kiloquads each), tricorders (6.91 kiloquads) and PADDs (4.3 kiloquads). However, the sheer size of the three cores each of which is as large as an entire office building indicates that almost the complete memory of the ship must be accumulated here. 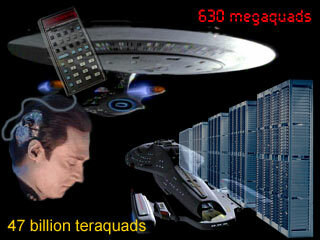 Since the Enterprise-D computer is the largest mobile computer to exist (TNG:"11001001"), 630,000 kiloquads should be the absolute upper limit for any stated data volume. It is plausible that only a small portion of this supposedly vast amount of data is relevant with respect to a specific problem, so the kiloquads and at most a few megaquads frequently mentioned in TNG make sense. 48 kiloquads - tiny amount of data from an alleged Starfleet message restored by Arturis in VOY: "Hope and Fear"
20 gigaquads - information uploaded by the space anomaly in VOY: "Twisted"
50 gigaquads - data required to restore Chakotay's personality in VOY: "Cathexis"
102 gigaquads - extent of part of the holonovel Doctor's unnecessary subroutines in VOY: "Author, Author"
15,000 gigaquads - extent of the Doctor's personality subroutine in VOY: "The Swarm"
30,000 gigaquads - data on romantic relationships collected by the Doctor in VOY: "Someone to Watch Over Me"
60 teraquads - data gathered from the anomaly in VOY: "One Small Step"
5 billion gigaquads - data collected on the "Warp 10" flight in VOY: "Threshold"
Millions of teraquads - volume of the Doctor's "fan mail" in VOY: "Virtuoso"
30 million teraquads - data collected during five years in VOY: "The Voyager Conspiracy"
All figures of specific data and, with one exception, even all figures ever mentioned on Voyager exceed the total Enterprise-D memory by far! It is silly beyond reason that even the Doctor's personal files would need more computer storage than was available on the biggest computer to exist so far. So is Voyager's computer and all related systems incredibly much more powerful? It almost seems so. If and how such a vast memory can be integrated in One's small body is still another question. Anyway, assuming that One downloaded the entire database in "Drone", Voyager would have as much as 75 trillion times the capacity of the Enterprise-D computer! This would compare like the entire internet to an obsolete pocket calculator! "Voyager's computer should be more advanced because it is a newer ship." A 75 trillionfold increase in a few years would be ludicrous. Using an analogy, a modern hard drive can "only" store the data volume of 200,000 books, a technology that exists already longer than the time from now to the 24th century. So Voyager would constitute 375 million times this progress over the Enterprise-D computer. In just one technological generation. Moreover, even with three-dimensional integration we should expect that the development of storage devices significantly slows down until the 24th century, considering that the physical limit (the one-atom memory cell) will probably be achieved as soon as in the 21st century. 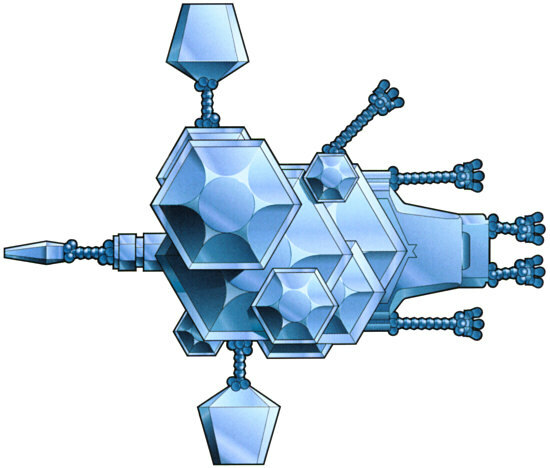 The ultimate rebuttal is the 10 million teraquads collected already by the Hansens on the small science ship Raven, a decade before the new flagship Enterprise-D was commissioned with only 630,000 kiloquads capacity. "Voyager has gel packs that might hold a lot more data than the Enterprise-D computer." Bioneural gel packs are not designed to hold large amounts of data, but for faster distributed processing. If anything, an organic storage can only be less dense than a crystalline one that can be designed to almost reach the physically possible density. 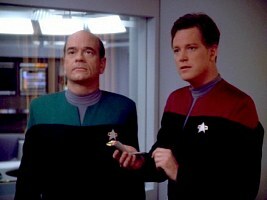 "Voyager's data seems to be raw data, of which a lot may be deleted later, or is compressed." Yes, but the raw data has to be stored somewhere in the first place. The drone One did download the whole 47 billion teraquads from somewhere on the ship. And regarding compression, it may achieve a lot (such as reducing the size of a picture to one tenth or less without visibly losing quality). But you wouldn't seriously expect to compress the contents of a Blu-ray disc to a few bytes. "Voyager's quad is not the same as an Enterprise quad. The unit has been redefined, just like the warp factors." This is utterly implausible, since the newer unit would be given a new name by any means to avoid confusion. The warp factors may not have been renamed because they still represent the same physical principle, only a refined version thereof. If at all, "new quads" would be defined so as to shrink the figures and not increase them to horribly unhandy billions of gigaquads. It is absolutely safe to say that the unit quad was not redefined. 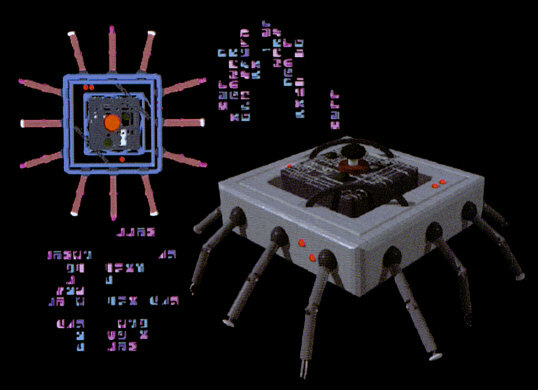 Nanites are microscopic robots for cellular surgery in living organisms (TNG: "Evolution"). The Borg have somewhat similar devices, nanoprobes, which assimilate the victim's body on a molecular scale, beginning in the bloodstream (VOY: "Scorpion, Part 1"). The names of both devices suggest that their sizes are in the range of nanometers and therefore at most one micrometer in size. Also, in "Evolution" Beverly states that nanites are "designed to have exposure only to the inside of nuclei during cellular surgeries." This seems to imply that they are considerably smaller than the nuclei, and hence at most some 1µm across. In this case it would be a problem to explain how the required computer power and mechanical functions can be integrated into such a small device - electrical and mechanical functions would be much the same on this scale. The absolute limit for construction should be the size of one atom which is between 10-10m (hydrogen) to 1nm=10-9m (complex atoms) in diameter. Realistically, we have to assume that the devices are made of a real material like silicon, with a concentration of about 1020 atoms per cubic centimeter. Wesley stated in TNG: "Evolution" that each nanite has a capacity of 1 gigabyte, which would be about eight billion single memory cells. This complies with my very rough estimation that billions of memory cells, each comprising a transistor or any kind of more advanced switching device, are required to implement the demonstrated basic "intelligence" and autonomous functions of the nanites or nanoprobes, not yet taking into account a consciousness. In a very optimistic assumption we can assume that one of atom out of 10 can be actually used as a switch while the others act as "wires" and "shields". We could get as few as 107 transistors in a generous volume (considering the prefix "nano-") of one cubic micrometer. Power supply, sensors and the mechanical parts are still not included, let alone a microreplicator in the case of the nanoprobes. A size in the micrometer range, however, would correspond with human cell sizes, e.g. the erythrocyte (red blood cell) with 8µm diameter, so they could still be used for cellular surgery. In "Scorpion, Part 1" we see a microscopic image or a simulation of Borg nanoprobes at a size somewhat larger than a red blood cell. Another way to calculate the size of a Borg nanoprobe may be using their mass that was indirectly given in VOY: "Inside Man". The Ferengi Gegis (who wanted to extract nanoprobes from Seven's body) was quoted that the nanoprobes were "worth two billion times their weight in latinum". As one single nanoprobe is supposed to be worth six bars of latinum and one bar weighs about 5kg, it would give us 15*10-9kg for a nanoprobe. As a solid cube of silicon (density 2.33gcm-3), such a nanoprobe would measure 186µm. Maybe a nanoprobe may be somewhat smaller if it contains a large amount of heavier metals, so we could still call it microscopic. The conclusion is that either the so-called nanotechnology is actually much larger than is usually assumed, or that there is some progress in that scientists outwit Heisenberg and use multiple and maybe even yet unknown quantum states of one atom in their devices. 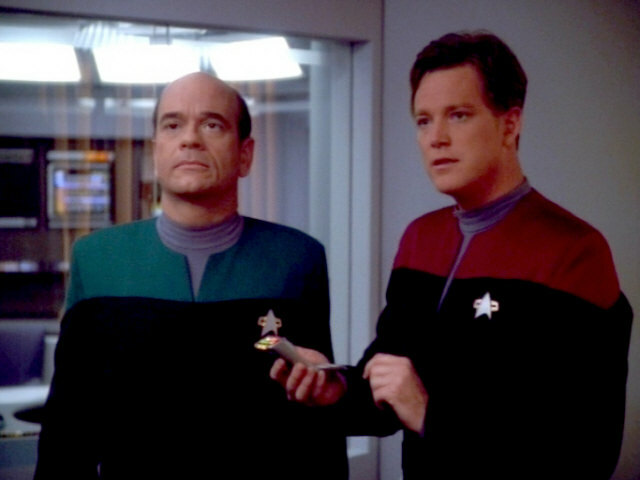 The on-screen information on whether it is possible to create a backup copy of a holographic program or character, in particular Voyager's EMH, is contradictory. Basically, if a holographic character is only software, then it should not matter where it is stored, and it should be possible to make as many copies as the storage capacity allows. The only plausible reason against copies would be that the program could be bound to a certain hardware with a certain architecture, like present-day neural networks that may not be implemented or may be hard to implement in a different hardware environment. But this is not the case in Star Trek, where holographic data is always liberally transferred back and forth. Even though there seems to be something special about holographic data (while the program is running), this special data is obviously converted to something that may be stored in a normal computer system (while the program is offline). The first time we saw holographic characters being stored somewhere else than on the holodeck was in TNG: "Ship in a Bottle". Professor Moriarty's and Countess Bartholomew's data were transferred from the holodeck to a small storage cube where the program continued to run. Clearly there was no intention to make a copy of them, as they had endangered the ship. But if something like an external storage device for holographic data exists, it is only plausible that it is intended as a backup device. I have the impression that the main computer core could perform the same function, and the isolation of the two dangerous holographic characters was only a security measure. In the first two seasons of Voyager the Doctor was confined to sickbay, but this was not because his program would only work in the very circuit architecture of sickbay, but because there were no holographic emitters elsewhere on the ship. Using present-day terminology, there were no monitors and cameras outside sickbay that would have allowed to display the Doctor and let him perceive the environment. The Doctor, however, could be transferred to one of the ship's holodecks at a time, as first seen in VOY: "Heroes and Demons". Being part of a hologrid now, it was suggested in the episode that the Doctor was now stored in the holodeck. The same applies in VOY: "Projections" where it was even more obvious that the Doctor had become a part of the holodeck. 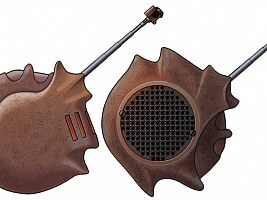 The mobile emitter from the 29th century that the Doctor could use since VOY: "Future's End" finally allowed him to walk around in any environment, with his program stored in this very emitter. If a holographic character is nothing more than a program that may be freely transferred between different types of storage devices, why isn't it possible to make a copy? Maybe because holographic data, in particular the Doctor's program, is too sophisticated? Well, in this case it wouldn't be possible to move it either. The episode VOY: "The Swarm", where the Doctor's program degraded because it had grown too complex, is still plausible in this respect. The real-life equivalent would be a Windows system with only a few megabytes of disk space left, therefore considerably slowing down the computer. On the other hand, this still wouldn't lead to the data loss that the Doctor suffered. In VOY: "Message in a Bottle" it was not possible to keep a backup when the Doctor was transferred to the Alpha Quadrant. The episode is even contradictory in itself, as an incredibly complicated "holographic data stream" is transmitted through a very unsafe and probably very narrow channel. That's like a present-day ship in distress would send a two-hour video message via long-wave radio instead of a simple SOS. Anyway, when Harry and Tom tried to program a new EMH in "Message in a Bottle", they had to start from scratch. Merely the outer appearance and the medical knowledge base was still available, but every special skill the Doctor had was lost. Only a few episodes later, in VOY: "Living Witness", a backup module with a seemingly fully functional Doctor was found on the Kyrian homeworld. It seems very unlikely that, only a few weeks after the futile attempt to create a new EMH, they suddenly developed a method to save a copy of virtually the whole program in a small storage device. 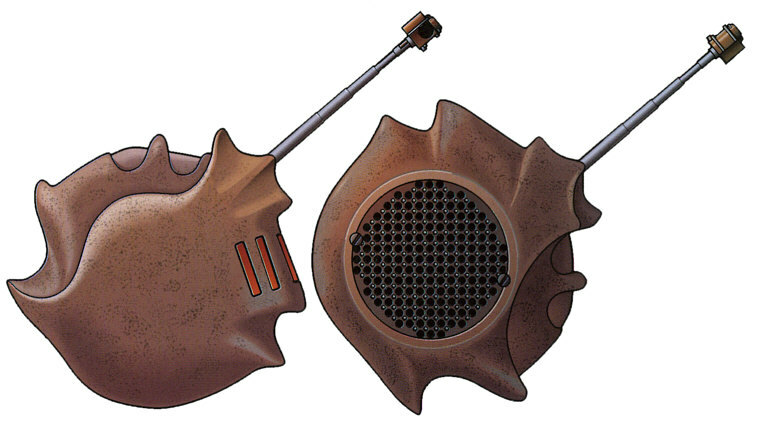 For the sake of plausibility, we may conjecture that this backup module existed from the very beginning, and that it was left on the Kyrian homeworld *before* the events in "Message in a Bottle". The backup module may have been a device that could not simply be replicated. On the other hand, why couldn't the mobile emitter perform the same function after the backup module was lost? It could have even been used to run two versions of the Doctor in parallel, whenever necessary. Moreover, if it was possible to make periodical backup copies of the Doctor until then, the Doctor's trouble in "Projections" and "The Swarm" would not have been that severe, as it would have been possible to retrieve him from the backup device. In particular in "The Swarm", resetting the EMH program to its initial state was said to be the only alternative, and there was no mention of a backup. Poor spare EMH in VOY: "Message in a Bottle"
Fully-fledged backup in VOY: "Living Witness"
The problem of holographic backups may be related to the "matter or energy" question of transporters (see Transporter, Replicator & Holodeck), considering that the transporter is not capable of simply duplicating matter just as the computer system may not duplicate holographic data. The difference, however, is that only one incident points to a possibility to store the patterns of persons in a computer system (in DS9: "Our Man Bashir") where copies may have been made if the data had not already occupied all of the station's storage devices. We may have to disregard this in order to keep the transporter plausible, so that there would be no similarity between physical patterns and holographic data any longer. The other way round, the attempts to convert holographic patterns to matter in TNG: "Ship in a Bottle" were futile. But, as already mentioned above, the running program with its quasi-physical projection should not be confused with the mere data which, as we know, may be stored anywhere. The only aspect not yet covered is that the Doctor, as a sentient lifeform, is unique or may have the right to stay unique. If the Doctor's integrity is lost and his program retrieved from a backup module, it may not be the same Doctor any longer. This aspect was never mentioned on screen, though. In all the above episodes where the Doctor's program was in danger the argument was always that there was no *technical* possibility to make or to use a backup. In "Message in a Bottle" where the loss of the program was foreseeable, a backup should have been mandatory. And at latest in "Living Witness", such a backup did exist. This agreement grants the crew of one (1) holographically enabled craft the rights to access and utilize the features and functions of one (1) Emergency Medical Hologram Mark I. 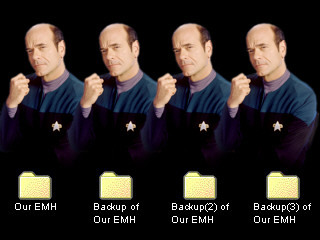 As allowed within this agreement, the operator (s) of the EMH Mark I software may create two (2) copies: one (1) BACKUP PURPOSES ONLY, one (1) portable holographically enabled device. 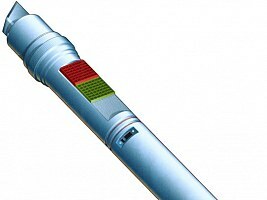 The EMH Mark I software may only be operated on one (1) device at any given time. This status will be confirmed through <insert technobabble radio impersonator here> communication. If no other device is using the EMH Mark I software, program will load normally. Attempting to run the program when a previous instance was detected will produce an audible and visual warning, and will display a copy of this license agreement. Any violation of this agreement would result in the immediate destruction of the device on which the data in question was stored, and a fine placed on those who copied the data. So see? It's not really a software or hardware problem. Just a legal issue. And everyone in the universe knows the golden rule: Never argue with a lawyer." We know from many Star Trek episodes since TOS that the usual scanning range of a starship is at most a few light years, but only for little specific scans that merely reveal the presence of a planet or a ship. In particular the biosensors are usually able to pick up specific biosigns only when the ship is in orbit. From a greater distance, it is only possible to determine that a planet had life, without knowing what kind of lifeforms. Alas, already in TNG sensors were often used as a plot device. Sometimes something specific could be detected although it was many light years away, and sometimes the ship ran into an anomaly that seemed to appear out of nothing. The climax of implausibility, however, is reached with VOY: "Workforce", where we see the most remarkable sensor enhancement ever. The biosensors can scan 83 star systems for specific lifesigns and finally locate them on a planet that is three days away at maximum warp - 25ly at Warp 9.9! This is far beyond credibility. It is even more annoying considering that the same episode explicitly mentions it to be a problem to transmit signals over 8ly, which the authors justify with technobabble about a "triaxilating frequency on a covariant subspace band". So the transmission of a well-defined amplified signal to a known location is a problem, while an omnidirectional search for faint lifesigns isn't? I think we have to disregard the whole scanner search in the episode to keep most of the rest of sensors in Star Trek credible. Federation starship crew members may be usually identified and located through their communicator signals in the 2360s and 2370s. As an additional safety measure, the communicators are equipped with a dermal sensor to recognize unauthorized users (TNGTM). This dermal sensor should also easily be capable of detecting whether a communicator has been discarded. In TNG: "Reunion", for instance, Worf put off his communicator when he went to take revenge on Duras. On Picard's request "locate Lt. Worf", the computer correctly stated that Worf was not aboard the ship and that he had beamed over. It was more like a symbolic act that Worf discarded the communicator, as he wasn't acting like a Starfleet officer. But on several other occasions, crew members very easily eluded the detection system by simply leaving their communicator behind like the possessed crew members in TNG: "Power Play", Dr. Bashir under the influence of Vantika in DS9: "The Passenger", Sisko and O'Brien in DS9: "Dramatis Personae" or Jonas in VOY: "Investigations". Or they gave it to someone else or posed as a different crew member like the Doc did in VOY: "Renaissance Man". Also, in DS9: "Dax" Jadzia was kidnapped, leaving her comm bade behind. Still, the computer located her on the station on Sisko's request. 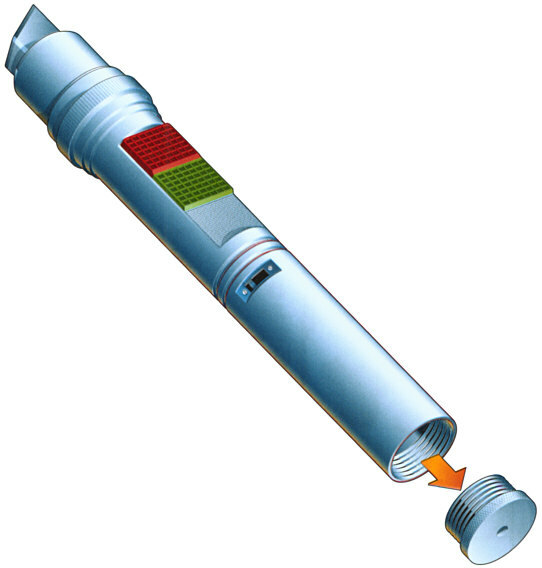 If the communicator detection system is so easy to deceive, one should assume that the internal biosensors have to be used in addition for a safe identification. But it wouldn't be so easy to tamper with them, and in the particular cases there was apparently no tampering. On a further note, it appears that there is no permanent surveillance of the crew's presence. Aside from the above examples of crew members who deliberately discarded their communicators or eluded it, we learn in TNG: "Schisms" that the absence of crew members is revealed only on request. Even Data's absence of 90 minutes while he was on duty did not ring any form of alert. The universal translator, which was explicitly shown as a hand-held device only in TOS: "Metamorphosis", must have been omnipresent already at the time of TOS. After all, we can't expect everyone in the galaxy to speak English. Although it has been suggested that every TV set actually includes a device that translates alien languages into English (or any other language that the series is translated into), it would be implausible if Starfleet officers could speak with alien species as if they all had the same mother language. In "Metamorphosis" Spock describes the universal translator as a device that compares brain wave frequencies to select comparable concepts as a basis for a translation. This explanation was necessary as the Companion in the episode was not capable of verbal communication. Still, it would be much more sophisticated than the function principle of the 24th century universal translator outlined in the TNGTM, where it is merely capable of analyzing the patterns of spoken language, essentially not more advanced than a combination of present-day voice recognition and translation software. An exactly simultaneous translation is definitely impossible, considering that grammar, most obviously the order of words in a sentence, is significantly different in human languages, let alone alien forms of communication. In many cases it would be necessary to wait until the end of a sentence before the translated version is definite and may be released. This would become obvious as a delay of up to a couple of seconds, but the translation to English as shown in Star Trek is not only immediate, but even lip-synchronous (obviously because the actors speak English). The artificial voice created by the translator would be superimposed to the original voice and, if both are located in the same room, result in a confusing babble. The original voice could be dampened or filtered out. However, in this case the translated version could not have the same spectrum. We may think of some very sophisticated filtering algorithms that could really largely eliminate the original, as experiments show that traffic noise may be canceled already today. This, however, would work only in a well-defined environment in which certain sounds come from certain directions, or it would require to have microphones and speakers everywhere in the room. The universal translator is definitely useless in a first contact situation. Even the most sophisticated program will never decipher a language based on the knowledge of only a few sentences, and it couldn't even recognize the difference between a cooking recipe and a declaration of war. The episodes TNG: "Darmok", DS9: "Sanctuary" and VOY: "The Swarm", where the universal translator fails or adapts only gradually, are remarkably realistic in this respect. Enterprise shows similar situations in "Fight or Flight" or "Civilization", for example, but in all instances the translation is still too fast. The knowledge of the syntax of many languages may help an advanced system to learn new languages faster, as it is proven by human learning. But the actual problem is not with the algorithms but rather with the standard vocabulary of which a certain percentage must have been recorded until the translator can make half-way reliable translations. It may seem like a minor point, but in some cases a translation is not even desired. We know from countless instances that single Klingon words are not translated to English. Likewise, Picard's occasional French (albeit only in the first two seasons of TNG) and the Doctor's Italian arias remain untranslated (assuming the device is active all the time even if usually everyone speaks English). Sure, taking into account a certain delay the translator could check back with a database of words which, depending on the context, should be kept as they are. But could Starfleet personnel have total faith in such a "creative" translator which could easily create a diplomatic incident? Maybe, if there should be really a universal concept of communication, as Spock pointed out, it may be possible to come to a translation faster by probing an alien's brain. In this regard the TOS translator may be a device that could allow a more direct communication than any approach to convert languages. On the other hand, I wonder if not many aliens would simply refuse to be probed, as the TOS communicator would essentially establish something like a telepathic link. But it is still possible that, rather than recording from there, the translator relays the translation as a non-verbal brain-wave pattern which is converted to spoken language as late as in the receiver's brain. This would alleviate at least the second of the three problems outlined above. On Enterprise NX-01 and NCC-1701 the crew routinely doesn't use personal communicators but intraship comm terminals in the walls or desks. In TOS: "Mirror, Mirror" we even see that the hand-held communicators work independently of the ship's comm system, most likely on other channels. When using the intraship system, "Bridge to sickbay" quite clearly identifies the location of the receiver, whereas in case of a message to a specific person like "Bridge to Captain Kirk" the comm system has to locate this person before sending anything. The call may be easily limited to just one comm terminal once Kirk pushes the button and reports "Kirk here" (which is redundant considering how easy voice recognition should be in the future). But we certainly wouldn't expect that for each personal call all comm terminals on the whole ship would be alerted in the first place -- which would become an extreme nuisance. So how is it possible that a call to Captain Kirk is always put through, seemingly without delay, to a comm terminal close to him? In order for the system to find out who is being called it seems inevitable that the message is being stored and not replayed on any comm terminal until the intended receiver is identifiable in the words. But after waiting like two seconds for the words "Bridge to Captain Kirk" synchronicity can only be maintained if the message is played with higher speed which never seems to be the case (unless we always hear it with the sender's ears). In addition, there must be some sort of personal identification tag similar to today's RFID to locate the addressee. However, if the comm system is capable of locating crew members, why isn't there a single instance of someone asking the computer for the whereabouts of a missing person -- just like it is customary in the 24th century (see crew location above)? When responding to a call, do the crew members of the TNG era have to tap their comm badges before speaking? Sometimes they do, sometimes they don't. Generally it wouldn't be necessary to touch the comm badge considering that "Riker here" can be considered a sufficient sign of the addressee being willing and able to speak. But just like it was already with the buttons on the comm terminals of the 23rd century, there may be a reason for an additional confirmation. Perhaps it speeds up the process, as tapping the badge in a reflex movement may be faster than answering vocally and letting the computer process it. Most likely for the same reason crew members customarily but not always address the computer with the word "Computer!" before issuing a vocal request. The computer's voice interface probably listens for vocal commands all the time, but the leading word "Computer!" may accelerate its recognition. Otherwise there may be a delay because the computer does not know whether one crew member is speaking to another one or to the computer, and would have to extract this information from a larger context. On a few occasions the system mistakenly generates replies although there is no request to the computer. This is the case, for instance, in TNG: "Remember Me" when Beverly, all alone on the ship, is talking to herself - albeit here on a hallucinated version of the Enterprise. Some screen caps from TrekCore. Thanks to Michael Zwettler for pointing out an error I made with the mass of the latinum in "Inside Man", to Sanfam for his suggestions about the EMH backups ;-), to Zhen Lin and Timwi for notes about the universal translator and to elviz and Liam for observations about the comm system.